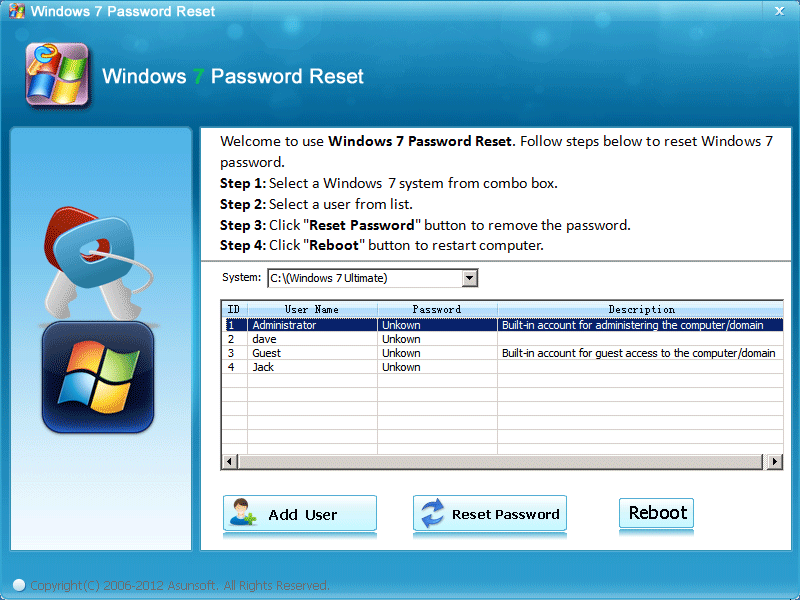 When you forgot Windows 7 password, Asunsoft Windows 7 Password Reset is your good choice to recover password instantly. It is useful that it can reset Windows 7 password within several minutes and has a friendly interface that even a PC novice can use it. Help you regain access to Windows 7 without files lost. ...... All you need is a writable CD/DVD or USB Flash Drive and a accessible computer. Asunsoft Windows 7 Password Reset supports all versions of Windows 7 operating system such as Windows 7 Home, Home basic, Professional, Ultimate etc. What's more, you can use this software to create new administrator account to Windows 7 without logining. With this new user, you can logon Windows 7 directly so that unlocking your computer. Step 1: Download and install Windows 7 Password Reset. Step 2: Run it to create Windows 7 Password Recovery disk. Step 3: Reset Windows 7 password by just one click. After successfully resetting a Windows 7 password, you can login Windows 7 without password, all original setting and files won't be changed. Qweas is providing links to Asunsoft Windows 7 Password Reset 4.0 as a courtesy, and makes no representations regarding Asunsoft Windows 7 Password Reset or any other applications or any information related thereto. Any questions, complaints or claims regarding this application Asunsoft Windows 7 Password Reset 4.0 must be directed to the appropriate software vendor. You may click the publisher link of Asunsoft Windows 7 Password Reset on the top of this page to get more details about the vendor.